UPDATED: Wed., April 4, 2018, 8:21 p.m.
Gonzaga is projected as a No. 1 seed, ranked in the top 10 and among the favorites to win the 2019 national title. So says ESPN.com bracketologist Joe Lunardi, seven absurdly early top 25 polls and Bovada oddsmakers. College basketball crowned Villanova as national champion on Monday and wasted no time looking ahead to next season. One 2019 preseason top 25 came out before the title game tipped off. The consensus is there’s a lot to look forward to for Gonzaga, which finished 32-5 and advanced to the Sweet 16 last season. 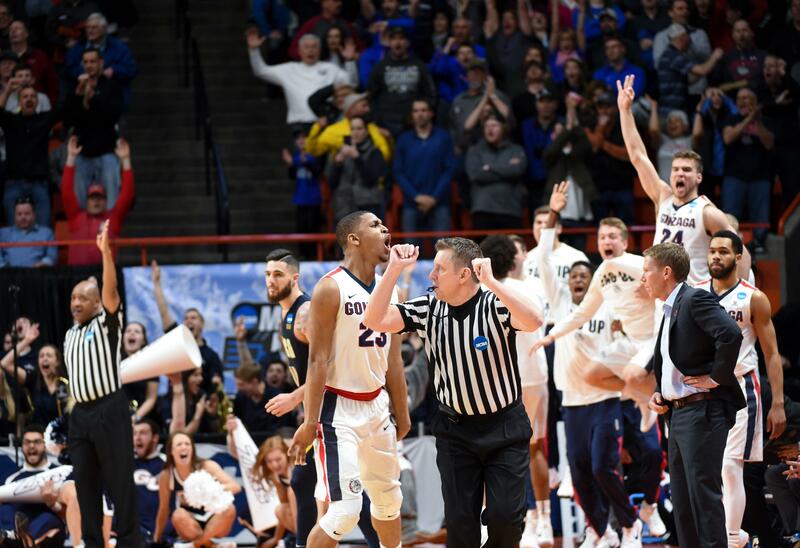 Of seven media outlets that issued 2019 rankings, the Zags were as high as No. 5 by USA Today and as low as No. 8 by SI.com. The average of the seven polls has Gonzaga at 6.42. “The Zags lose some key pieces in Johnathan Williams and Silas Melson,” USA Today wrote. “They could also see upstart talent Rui Hachimura depart early for the NBA. Regardless, coach Mark Few should have a talent-stacked roster poised to go even further than the Sweet 16 – where the Bulldogs bowed out two weeks ago – next March. Norvell’s 28 points came in the second round against the Buckeyes and Tillie’s first name is Killian, but clearly USA Today likes GU’s potential. Kansas received the No. 1 nod in five of the seven top 25s. Duke was in the top spot in two polls. Villanova was usually listed No. 3, although it was No. 2 in one poll. Lunardi’s projected No. 1 seeds are Gonzaga, Duke, Kansas and Villanova. He has the Zags facing No. 16 Lipscomb in Seattle in the first round. No other WCC teams made Lunardi’s field of 68. Nevada, of the Mountain West, is seeded third. The Pac-12 was represented by Oregon and UCLA, both five seeds, and Arizona State, a 10 seed. The Big Sky’s Montana is a 15 seed. Bovada lists Gonzaga’s odds of winning the 2019 championship at 20-to-1, tied for seventh along with Michigan State and Virginia. Duke is the favorite at 6-to-1, followed by Kansas at 7-to-1. Kentucky and Villanova are both 8-to-1. One day after falling to North Carolina in the 2017 championship game, the Zags were 14-to-1 to win the 2018 title, according to Bovada. Within a few weeks, Zach Collins and Williams-Goss declared for the NBA Draft. Published: April 4, 2018, 6:35 p.m. Updated: April 4, 2018, 8:21 p.m.